St. Mary’s University Associate Professor Camille Langston, Ph.D., has made a career of teaching college students to develop critical thinking and writing skills that will allow them to succeed after graduation. And a new research project has led the way for her to share those skills far beyond the campus classrooms in ways that she hopes will significantly impact both school children and their teachers. 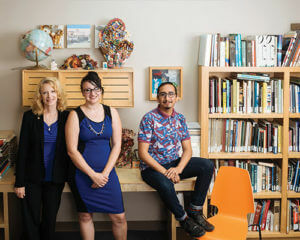 When Langston, Chair of English and Communication Studies, set her sights on bringing writing skills into San Antonio’s underserved classrooms, she found a willing partner in the nonprofit, multidisciplinary arts program called SAY Sí. “Rhetoric is about doing and being active in your community,” said Langston. Supported by a University faculty development grant, her goal was to create a community of writers and prepare young San Antonio students for higher education and professional careers — filling a void through the services already being provided by SAY Sí. 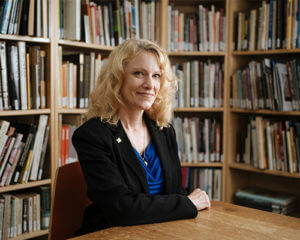 Feeling a connection with SAY Sí, which helps students develop artistic and social skills, she joined Stephen Guzman (B.A. ’12), a former student of hers who is now communications manager for SAY Sí, and Amber Calvillo (B.A. ’17), her student research assistant when the project launched in Spring 2017. “When Dr. Langston came to SAY Sí with this opportunity, we knew that if we were to teach our instructors and mentors the skills she provided, then they could be implemented into our classes and studios,” Guzman said. With the partnership in place, Langston and Calvillo created a series of workshop lesson plans on topics such as corporate communications, diction and editing, and then trained SAY Sí instructors to teach these skills to their students. Since the last workshop in May, both Langston and Guzman said that SAY Sí instructors have taken what they have learned and incorporated that into their art lessons. For example, instead of simply creating art, the students write their own artist statements and biographies, and use an edit-and-review process to think differently about what they write. “As a creative organization, it’s important we learn how to tell our stories. That’s what art making is — to tell a story,” Guzman said. SAY Sí is a year-round, tuition-free creative youth development project that provides San Antonio students opportunities to develop artistic and social skills in preparation for high educational achievement and professional careers. Learn more at www.saysi.org.